Chattagram Maa-O-Shishu Hospital Medical College Job Circular 2019 has been published by their authority in daily online job portal and to get from the best jobs and the education portal website in BD Jobs Careers- www.bdjobscareers.com. For your help, we would like to inform you that, Chattagram Maa-O-Shishu Hospital Medical College is a private medical school in Bangladesh, It was established in 2005 and located in Agrabad, Chittagong. It is affiliated with the University of Chittagong. The good news is, recently the origination hire various position new manpower for their hospital null vacancy. 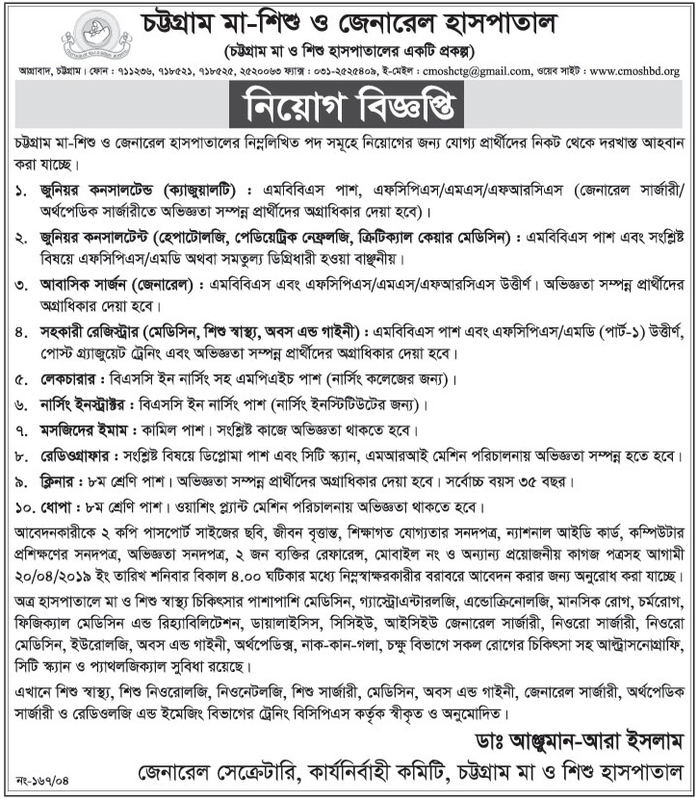 Anyway, if you are interested private Medical College Hospital jobs, you can see this one, the BD Jobs, Careers have given full information with the jobs circular image. If you want to more private medical jobs circular to visit www.bdjobscareers.com. The Jobs Circular website has been sharing most recent job advertisement such as all government jobs in Bangladesh 2019, private job circular in Bangladesh, recent bank jobs in Bangladesh, international organization jobs in Bangladesh, part time jobs news, full time employment info, multinational company job circular in Bangladesh, HSC pass obs, MBA jobs, BA Jobs, private and government university jobs in Bangladesh, online newspaper jobs in Bangladesh, and more for people. Just connected with our Facebook Page and Facebook Group. Hopefully you will be gets all categories recent jobs advertising. Thanks for stay us. This entry was posted in All Jobs, Chittagong Jobs, Graduate Jobs, Hospital Jobs, Medical Jobs, Medical/Pharma by admin. Bookmark the permalink.